I may have my blogger card revoked, but I have to admit that not only did I not take notes last weekend, I didn’t even take a camera. I know, I know. But I just wanted to enjoy it, and soak it in, and I knew I could easily get carried away trying to write everything down or take a hundred pictures. So you’ll just get a little snapshot of the weekend from what I can remember. I did take some pictures with my cell phone, but only one came out. 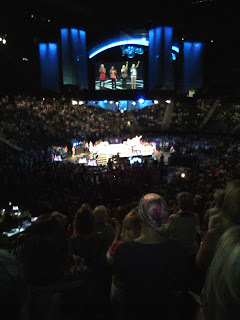 Friday morning, I sat at the top and ended up getting a pretty good picture of the arena and the stage while the Worship Team was singing. Well, pretty good considering the lights were out. Speaking of the Worship Team, those four ladies did an amazing job all weekend! Beautiful voices, lots of energy. It was a great way to start off the day! Friday morning, Sheila Walsh spoke. Somehow I had missed reading anywhere that Sheila grew up in Scotland. Love, love, love her accent! And the woman can sing! A person could seriously be intimidated by her: she can sing, she’s a great author, a funny and convicting speaker, she’s beautiful, and she has a cool accent. Steve Arterburn spoke about tearing down walls that are keeping us from being close to others. For some reason, I thought Saturday morning started at 10, but it started at 9, so when I got there at 9:30, I had missed the first part of Laura Story’s… story. She does have an amazing singing voice, though. Nicole Johnson and Angie Smith both made us laugh and cry while telling their deeply personal stories. I knew I stashed those tissues in my purse for a reason. 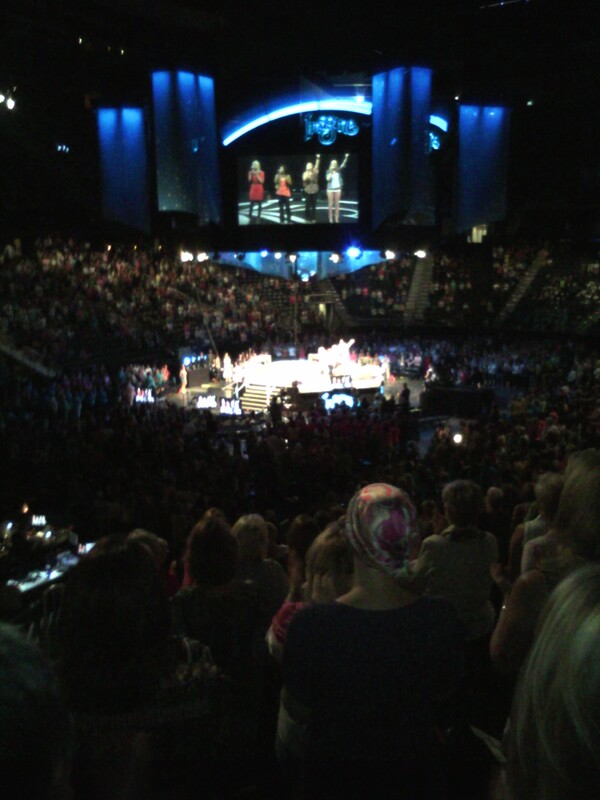 Luci Swindoll shared her message of celebrating life. “Should I enjoy the world or improve it? If you enjoy the world, you DO improve it.” I love that woman and we were so blessed to hear her speak. She had just recovered from bronchitis and hadn’t been able to talk at all for almost two weeks. Then there was the music of Natalie Grant and Mary Mary. Absolutely incredible. One of my favorite parts of the whole weekend, though, was watching the sign language. Friday I sat up high (when I took that picture), but Friday night and Saturday, I had a floor seat, not far from the stage. (Thank you, BookSneeze!) Not far from my seat was the sign language interpreter and two deaf ladies for whom she was signing. Watching her sign the worship songs was especially beautiful, and I loved watching when all three of them were signing the songs. It was an amazing weekend and I’m grateful to the BookSneeze program for providing me an opportunity to attend.